At Learning Dynamics, we're all about client success. Our training programs are designed to enhance the professional growth of employees in every industry. The training programs we offer have the potential to dramatically impact your company's return on investment. Customized Programs Tailored to Client Needs and Organizational Goals Learning Dynamics creates customized corporate training programs tailored to the needs of our clients' short and long-term business goals. We partner with our clients to ensure that their goals are being met by ensuring that we have a clear vision of the unique needs and challenges faced by each one we serve. Learning and development solutions for corporations, non-profits and other organizations come from our in-depth consultative approach designed to maximize the return on your development investment. Course content and instruction now available in Spanish. Compliance, Diversity, Performance, Business Ethics and Workplace Violence Prevention. This award-winning program provides managers and supervisors with a clear understanding of the importance of fair, consistent treatment of all employees as well as the consequences of unprofessional or illegal workplace behavior - for individual employees and the organization as a whole. The interactive workshop format emphasizes the strong link between employee satisfaction, customer loyalty and profitability. Download our Fall 2016/Winter 2017 white paper to see how Learning Dynamics clients have used the program to improve their workplaces. This program can also include a module on cross-cultural communication. This program heightens workplace diversity awareness between employees and senior management, helping all to understand that diversity creates an organizational culture that maximizes workforce potential at all levels of the organization. This program can also include a module on cross-cultural communication. People are any organization's most important asset: however, finding and retaining the “right” people can be difficult - even for the most progressive, industry leading organizations. This program tutors managerial staff on how to use proper, state-of-the-art interviewing techniques to ensure that the best candidates are selected for the right positions. Successfully managing the performance of others involves much more than conducting an annual one-on-one performance evaluation. Motivated employees are encouraged to do their best every day based on mutually developed performance goals supported by an ongoing management-employee partnership. This training program focuses on developing the managerial skills needed to continuously motivate employees in today's ever-changing work environment. This business ethics training program illustrates the importance of ethical decision making that transcends adhering to compliance laws and company policies. Available in both classroom presentation and e-modules, this program addresses the need for honesty and fairness in today's workplace. This violence-prevention training program was originally developed by a renowned workplace security executive in response to the growing need for awareness of potentially violent employee reactions to change. Providing managers with the intuitive skills needed to thwart potentially harmful situations, this program takes a pro-active approach to identifying - and addressing - employee dissatisfaction. Topics include handling conflict, identifying potential violence and unfair treatment, recognizing threats and identifying erratic behavior. Sexual harassment awareness and prevention is imperative in today&apos;s work environment, as it is in line with an organization&apos;s values and culture. This workshop provides managers with an understanding of the importance of fair and professional treatment of all staff, as they may put themselves and their organizations at risk if they act unprofessionally and/or unlawfully. Harassment is also bad for a company&apos;s reputation and bottom line. We also offer a non-manager version of this program that de-emphasizes the legal aspects and focuses on a professional and respectful work environment. With today's proliferation of social media, it is important that managers and employees portray themselves in a positive and professional manner. “Social Media Usage and Etiquette in the Workplace” reinforces an organization's social media policy. The manager version also can address the potential use of social media in the recruiting process, and the associated risks. In addition to offering these programs, we also provide Surveys, Program Design, and Needs Analysis services. Please contact us to find out more. Improving Employee Performance, Coaching for Results, and Demonstrating Emotional Intelligence. This supervisory training program offers targeted strategies for use in overseeing employees. The goal of this program is to enhance their leadership and motivational capabilities in a supportive, positive manner to achieve maximum results for the employee and the organization. Many employees possess leadership potential, whether or not they have attained supervisory status. This program illustrates how to identify, encourage, and mentor employees who have demonstrated leadership potential within the organization while encouraging team synergy and cross-functional team strategy for optimum success. This program teaches supervisors and managers how to effectively improve employee performance by using a collaborative coaching style. Special emphasis is given to the importance of regularly scheduled consultative sessions between supervisor and employee in order to accurately gauge measurable results that will benefit the employee and the organization. With the vast amount of data available within most organizations today, it is essential that leaders and managers use this data properly when making decisions. The proper use of data will result in better quality decisions for both departments and the organization. This highly customized workshop examines the data available within an organization and looks at ways to use the data. Supervisors and managers are often reluctant to share the responsibilities of their department with their staff in today's ever-changing work environment. In order to maximize efficiency and proactively pursue emerging opportunities, effectively delegating work assignments is important in a progressive organization. This program illustrates how to delegate effectively for maximum results. Great business leaders recognize the need for keen observation of leadership qualities in others, recognition of "idea people" who can propel the organization into the future as an industry leader, and the ability to accurately analyze potential while tempering that with compassion. These are attributes known as Emotional Intelligence (EI). Workplace studies have shown that EI is valued nearly twice as much as superior intellect in today's workplace. This program is designed to maximize the value of EI with leaders who are entrusted with motivating staff. Effective communication is one of the most important and powerful tools used by every successful leader. With effective training, leaders can maximize the positive impact their communication style and message has with all audiences, including employees and external audiences. In this interactive workshop, participants will assess and analyze their own communication styles and learn tactics to leverage the advantages of each style. Managers and supervisors will improve their abilities to understand, be understood, and drive performance on a foundation of professional communication fundamentals. Change seems to occur at a breakneck pace in every organization in today's workplace. Managers face the challenge of instilling and maintaining a positive outlook while their staff and the entire organization attempt to adapt to mergers, acquisitions, and the consolidation of multiple departments. This workshop explores the possible repercussions of constant change in today's organizations. This workshop focuses on the changing demographics in organizations and discusses how to adapt with a positive, "can-do" attitude for all concerned. Topics covered include analyzing the workplace motivation in the traditionalist, the Baby-Boomer, and Generations X and Y, while offering workable strategies for creating a harmonious, productive, positive work environment for all. Learning how to effectively use conflict as a motivating force in today's workplace can actually improve relationships with employees and clients. This interactive workshop illustrates how management can address workplace conflict and achieve positive results in the process. Understanding how to effectively lead members of a team in different locations is important in today's global workforce. This e-module closely examines the critical cross-border and cross-cultural issues that leaders, supervisors and managers will face in a highly diverse and disbursed workforce. This is an interactive e-module customized to suit the needs of each individual client. Managing Virtual Teams Webinar. This program can also include a module on cross-cultural communication. Studies continue to show the strong correlation between employee engagement and such factors as productivity, reduced turnover, and team effectiveness. The “Manager's Engagement Playbook” workshop provides leaders and managers with strategies and tools to increase the levels of employee engagement. Participants will learn from examples of companies leading in engagement and will prepare their own blueprint for engagement success. Mentoring is a skill that progressive organizations value. A leader or manager can use mentoring skills to help develop staff. Whether it is a formal mentoring program offered by the organization, or informal mentoring, the “Mentoring for Success“ program provides knowledge and skills for mentoring success. Building, motivating and maintaining a high-performance team requires patience, understanding, and implementing the basics of successful organizational development. Although this focus demands time and effort, the results pay large dividends - for the team as well as for the organization. This program teaches how to identify and encourage high-performing teams to reach and maintain their maximum potential in a collaborative effort to meet - or exceed - organizational goals. Today's leaders are expected to demonstrate strategic planning skills to drive their organizations to superior performance and success in the face of unrelenting competition. The challenge for leaders is not to get too caught up in the details, and to devote time to long-term, big-picture thinking. Leadership involves engaging and inspiring people to do their best work and to achieve common goals. Servant Leadership (CL) is a model that encourages formal leaders to start with the drive to serve followers, customers and other stakeholders. This engaging program helps supervisors, managers and senior executives learn how to use the servant leadership model to generate organizational success while avoiding some of the common pitfalls that can come from adopting the model. In today&apos;s environment where employers must compete to attract and retain talented employees, succession planning is critical to success. Winning organizations identify potential, recognize performance, and understand when staffing changes could be appropriate. The 9-Box talent assessment and succession planning tool makes the process systematic and effective. This highly customized, interactive workshop presents the 9-Box Grid assessment and succession planning tool to your organization&apos;s managers, giving them a valuable process to meet this human resource challenge and opportunity. This engaging, interactive workshop is used by progressive organizations that actively focus on grooming high-potential individual contributors for supervisory roles. Recently promoted supervisors often struggle in their attempts to make a successful shift into management, and this is often due to a lack of proper training. The content of this workshop includes mini case studies that are modified to target the specific needs of the audience as well as the organization as a whole. Topics include "Influencing Others," "Managing Conflict," "Multi-tasking and Delegating," and "Supervisory Derailers." "Skill Sharpener" reminders are e-mailed to each workshop participant for three months post-workshop to gauge progress. As organizations ask more of managers, it is even more critical that managers work smarter and manage their time well. Managers today can become overwhelmed if they are not time-effective in overseeing their areas. This program discusses the importance of goal setting and delegation as well as other key skills that will help managers and supervisors get the most production out of every day. In addition to these programs, we provide Assessment Centers, Executive Coaching, Strategic and Succession Planning services. Writing for Business, Managing Stress and Projects, and the Art of Verbal Communication. Change is perhaps the only constant nowadays in many organizations. Yet change is often difficult for people, causing high levels of confusion, frustration, and stress. Change Mastery helps employees understand what specifically is changing, realize that their reactions to change are normal, and explore ways that they can master change by focusing on areas they can influence and control. This interactive workshop teaches verbal and written communication techniques to use in a variety of workplace situations. Participants will learn the 4 major pillars of effective communication and to master the art of face-to-face, phone, and e-mail communication. Participants will also practice techniques to effectively convey information and identify their own communication strengths and weaknesses. This program can also include a module on cross-cultural communication. Progressive organizations recognize the need for staff to communicate with customers and employees who originate from diverse cultures. 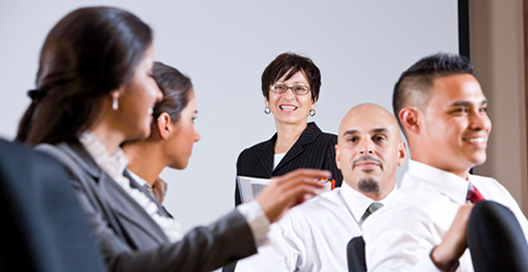 This program teaches verbal communication techniques to use in a variety of workplace settings. The program reinforces the need to demonstrate respect for cultural differences. Participants will also practice conveying information and identifying their cross-cultural communication strengths and areas for development. We know that managers and employees spend the vast proportion of their time engaging in some form of communication with others. Some of this time is spent contending with and seeking to resolve conflicts. Managed conflict can have a positive effect on the workplace since it can open the lines of communication and strengthen relationships with employees and customers. This program teaches participants how to turn potentially negative situations around to help everyone win. This program introduces new project managers to the successful key concepts of project management, including dynamic communication, strategic planning, conducting successful meetings, and how to segment projects into successful presentations. In today's increasingly complex work environment, individuals often work in multidisciplinary, cross-functional teams. They are called upon to work together to achieve results and to improve processes. More often the power to influence is becoming a sought after skill. This program focuses on the methods to influence and persuade in a win-win way, without incurring unnecessary conflict or resistance. This workshop focuses on the importance of successfully managing stress in today's multi-tasking business environment. Great meetings - those that get work done and keep everyone engaged and participating - take planning and skilled facilitation. Poor meetings are unproductive, demotivating time wasters. Give your team the skills they need to run results-focused meetings. In today's hectic work environment, it is important that employees effectively multi-task and juggle multiple priorities. Shifting tasks requires the ability to stay organized and not become overwhelmed. This workshop provides practical tips and techniques that can be put to use immediately. Participants learn to work smarter, not necessarily harder. Effective verbal communication is more than an imperative skill in today's business world: it is ESSENTIAL. This program encourages participants to develop and master the art of effective speaking in business situations. This program can also include a module on cross-cultural communication. The content of this highly interactive workshop encourages participants to explore and personally experience the positive effects that effective teamwork can have when appealing to clients. Participants will also have an opportunity to confidentially assess the effectiveness of their own team while they discover creative ways to support and lead their team. Writing targeted, well-composed, relevant correspondence and presentational material continues to be one of the biggest challenges to managers and employees in today's workplace. Everything written represents not only ourselves, but our organization as well. This workshop is designed to help participants incorporate their own personal style into their writing while communicating clearly and professionally to various audiences. More than ever today, it is critical that an organization's employees work as a team in order to meet customer's needs. Communication, internal customer service, and adapting to change are three of the hallmarks of being team-oriented. Working as a High Performance Team emphasizes how teamwork often results in achievement of a department's goals, as well as how to contribute as a team member. This program can also include a module on cross-cultural communication. Workplace and societal diversity can sometimes create communication barriers. Our customized English as a Second Language (ESL) programs are structured to incorporate industry and organization-specific language to maximize employee communication, productivity, safety and teamwork. Classes are designed and delivered by seasoned ESL instructors and include pre and post-training evaluations to measure progress and the need for additional work. Providing Stellar Service, Maximizing Sales, and Enhancing Business Development Skills. Building customer relationships is the cornerstone of generating sales revenue. As the business world continually evolves to incorporate new ways of connecting, communicating, and building relationships, those who will be successful in sales must learn to adapt to reach decision-makers. This program offers proven business development techniques and the latest strategies of using social media and other tools to find new customers and close more business. Winning sales and service organizations make continual employee coaching a priority. This program equips managers with the tools and techniques they need to provide ongoing feedback and coaching using a positive, team-building approach that inspires improved performance and commitment. This program is customized to the client's business, industry, and unique needs. Once a prospect for your company's products and services is identified, employees must be able to make a persuasive and professional sales presentation to be successful at closing new business. Incorporating many ideas to make the presentation relevant and compelling, this program will help your sales team shine when they have the opportunity to present and close the sale. Superior customer service is waning dramatically in today's high-tech service sector. Exceeding customer service expectations will certainly set any organization apart. This program effectively illustrates how to provide superior customer service to clients in today's hectic work environment. This program can also include a module on cross-cultural communication. All who work in customer-facing roles enjoy pleasant interactions and the ability to meet customers' needs without difficulties or conflict. Unfortunately, difficult conversations are part of delivering outstanding customer service, so employees and supervisors need to know how to do it well. Mastering Difficult Customer Conversations takes training participants through the entire customer service, service recovery, and relationship building process. This program can also include a module on cross-cultural communication. This highly interactive workshop presents a competitive sales strategy for understanding a customer's needs, creating customized solutions and making recommendations that meets those needs. Successful sales professionals know how to manage their calendars to maximize production by prioritizing and planning. This practical sales training program will help participants learn to use their existing time management tools better by helping them to strategize their scheduling to be in front of the customer more often. Stress management ideas are also presented to help your team avoid burnout. Negotiation is a critical and often overlooked part of sales training. Every customer is looking for the best possible value and every sales person seeks to maximize revenue. Understanding this part of the sales cycle and learning skills that allow negotiations to be a natural, relationship-building process by which everyone benefits is a key to this program. In addition to offering these programs, we also provide Focus Group Facilitation and Mystery Shopping services. Tailored Programs Covering a Range of Topics from Employee Performance to Sarbanes-Oxley. We are pleased to partner with our long-time friends from the Center for Financial Training (CFT). Please explore CFT 's outstanding bank-specific courses, webinars and banking schools at www.cftnow.org. Are your leaders prepared for tomorrow's challenges in the financial industry? Learning Dynamics provides programs tailored to your needs, whether you require Succession Planning or Leadership Development. Click here for a more detailed description of Investing in People. Learning Dynamics is pleased to stay at the forefront of changes in the banking and credit union industries. As part of our continual and ongoing effort to help our clients maximize sales, service, profit, and operational performances, Learning Dynamics has leveraged its many years of working with industry leaders and our team members, many of whom have significant experience in the industry, to create and offer this next generation of banker training and development. As banks and credit unions adapt to the rapidly changing landscape of the financial services industry, many are making the decision to expand the role of front-line customer-facing employees. A challenge for many institutions is helping their Branch Managers learn how to lead more capable and empowered Universal Banker employees. Banks and credit unions have identified the need to empower customer-facing employees to do more, becoming a single point-of-contact for customers. The Universal Banker model, one that employs more versatile and skilled employees, requires thorough professional training and development if these team members are to be successful and if the move to this business model will be effective and profitable. This program helps Universale Bankers develop the skills necessary to be successful. This program is specifically designed for interdenominational church leaders who wish to bring their congregations to the next level. Programs and workshops focus on such topics as effective fundraising, work/home life balance, motivating staff, multi-tasking for optimum results, and developing a targeted strategic plan. This interactive and highly-targeted program format emphasizes the strong link between church leaders and parishioners in achieving sustained success in a challenging, competitive work environment. We are a proud Career Partners International Firm. Our Respect & Support™ customizable outplacement services are built around your needs, culture and brand to ensure that your exiting employees get the help that they need during transition. Programs are customized to best meet the needs of employees at all levels ranging from individual contributors to senior leaders and executives. We developed our Respect & Support™ outplacement services with the same high standards as our other award-winning programs. All outplacement assignments are managed by industry experts in the field and professional resume writing support.